Alabama 2010: Summary Population and Housing Characteristics. U.S. Census Bureau, 2012. For Hispanic/Latino statistics, see tables 3, 4, and 18. Alabama State Fact Sheet. UnidosUS, 2016. UnidosUS (formerly The National Council of La Raza) is a nonpartisan Hispanic civil rights and advocacy organization in the United States. Condition of Education, 2017. National Center for Education Statistics, 2017. This report looks at all states and rural vs. urban areas. County Health Rankings in Alabama. County Health Rankings & Roadmaps, 2018. This page summarizes the report. You can download the full report; information on Hispanics/Latinx is on pages 3, 4, 5, and 13. Demographic Profile of Hispanics in Alabama, 2014. Pew Hispanic Center. You can break the Alabama statistics down by county. Hispanic Health Profile: Alabama. Alabama Department of Public Health, 2003. While older, this report looks at all aspects of health in Alabama Hispanics, including diseases and infant morality. Hispanic Population 2010. U.S. Census Bureau, 2011. 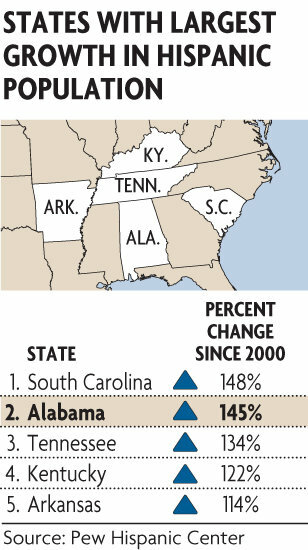 Table 2 compares Alabama's 2000 and 2010 populations. This brief also has a number of tables showing percent changes in Alabama's counties and Latinos as a percent of the total population. The next census will be in 2020. Hispanic Population in Alabama. U.S. Census Bureau, 2011. Alabama projections are on page 56, and other Alabama statistics are on pages 22, 23, 28, and 135. Also review the brief Knocking Update: New Data about Private High School Graduates. Latino Growth in Metropolitan America: Changing Patterns, New Locations. Brookings Institution Center on Urban and Metropolitan Policy, 2002. This site has many statistics on Hispanics in the United States including language use, politics, and racial identity. Search for “Alabama” in the box on the home page. From the U.S. Census Bureau, this gateway site links to reports, tables, census data, and related topics. Destino Birmingham. UAB Digital Media, 2001. La Casita. UAB Digital Media, 2007. Sweet Home Alabama. Vice, 2011. Una iglesia = One Church. UAB Digital Media, 2007. Alabama al día: A Report on Hispanic Cultures in Alabama. Montgomery: Alabama State Council on the Arts, 2007. Globalization and the American South. Athens: U of Georgia P, 2005. Irresistible Forces: Latin American Migration to the United States and its Effects on the South. Albuquerque: U of New Mexico P, 2009. Latinos and the U.S. South. Westport: Praeger, 2008. Latinos in the New South: Transformations of Place. Aldershot, Eng. : Ashgate, 2006. Latino Workers in the Contemporary South. Athens: U of Georgia P, 2001. New Destination Dreaming: Immigration, Race, and Legal Status in the Rural American South. Stanford: Stanford UP, 2011. Oxford Encyclopedia of Latinos and Latinas in the United States. New York: Oxford UP, 2005. “AG Census Reveals Alabama Trends.” Southeast Farm Press March 2004. 17. Brooks, Jennifer E. "'No Juan Crow!'." Southern Cultures 18.3 (2002): 49-56. Bullock, Charles S. and M.V. Hood. “A Mile-Wide Gap: The Evolution of Hispanic Political Emergence in the Deep South.” ﻿Social Science Quarterly﻿ 87 (2006): 1117-35. Campbell, Kristina. "The 'New Selma' and the Old Selma: Arizona, Alabama, and the Immigration Civil Rights Movement in the Twenty-First Century." Journal of American Ethnic History 35.3 (2006): 76-81. Jacobson, Louis. "The Hispanic Dynamic." State Legislatures 41.6 (2015): 16-20. Johnson, Kevin R. "A Political Explanation of the Popularity of Unconstitutional State Immigration Enforcement Laws." Journal of American Ethnic History 35.3 (2016): 68-75. Lewis, Anne C. “Growing Hispanic Enrollments: Challenge and Opportunity.” Phi Delta Kappan. 80.1 (1998): 3-4. McDaniel, Paul N. and Anita Drever. "Ethnic Enclave or International Corridor? Immigrant Business in a New South City." Southeastern Geographer 49.1 (2009): 3-23. Mohl, Raymond A. “Latinization in the Heart of Dixie: Hispanics in Late-Twentieth-Century Alabama.” Alabama Review 55 (2002): 243-74. ―. “The Nuevo New South: Hispanic Migration to Alabama.” Migration World 30.3 (2002): 14-18. ―. “The Politics of Expulsion: A Short History of Alabama's Anti-Immigrant Law, HB 56." Journal of American Ethnic History 35.3 (2016): 42-67. Parker, Suzi. “Hispanics Reshape Culture of the South.” Christian Science Monitor June 1999: 136. Robertson, Campbell. "After Ruling, Hispanics Flee an Alabama Town." New York Times 4 Oct. 2011: A1. Yeoman, Barry. “Hispanic Diaspora.” Mother Jones Jul.-Aug. 2000. 34+. Articles are found in Databases. 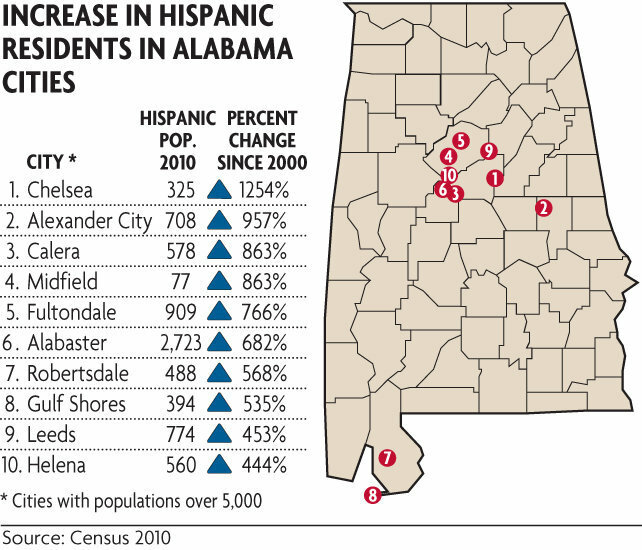 The Birmingham News has published many articles about the influx on Hispanics in Alabama. You can search the archives on their page (www.bhamnews.com/archives) and then view the microfilm in Sterne Library for dates before 2009. After 2009, you must go to the Birmingham Public Library and use the NewsBank database. For information on finding articles in other Alabama newspapers, refer to the guide Alabama Newspapers in UAB Libraries Databases. This is the full text to the controversial immigration law passed in 2011. “Hispanics and Latinos.” Encyclopedia of Alabama. 29 Aug. 2012. The New Latino South: The Context and Consequences of Rapid Population Growth. Pew Hispanic Center. 26 July 2005.